Designed for all trail riders and can be made race-legal by adding shoulder pads. Waterproof front shell and nylon mesh back; closed-cell foam for race-proven protection. Closed cell foam and UHMW plastic laminate armor provide eight times the protection of HDPE panels. Armor does not absorb water and will provide a measure of flotation, but is not Coast Guard approved. Zip-off fleece collar keeps neck warm, diffuses rising heat and reduces fogging. Convenient front zipper access and handy reverse-entry, two-stage pocket design. Can be worn over a light jersey or under a snowmobile jacket. 4in. of waist adjustment. Optional quick-attach shoulder pads available. 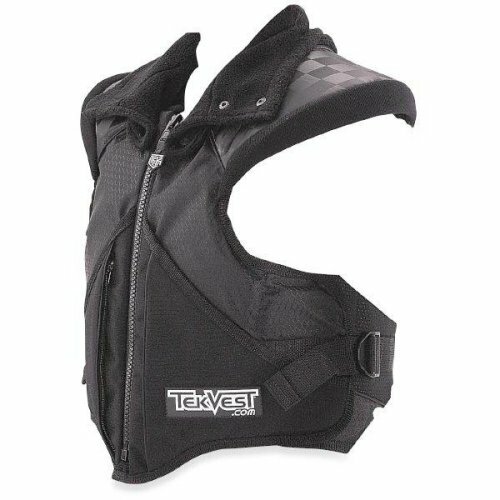 ISR legal for drags, oval and radar runs; add optional shoulder pads for use in cross country or snocross racing. All-black fabrics for a richer, technical look. Weight 175-200lbs. ; Jacket Size 42/46in. If you have any questions about this product by Tekrider, contact us by completing and submitting the form below. If you are looking for a specif part number, please include it with your message.